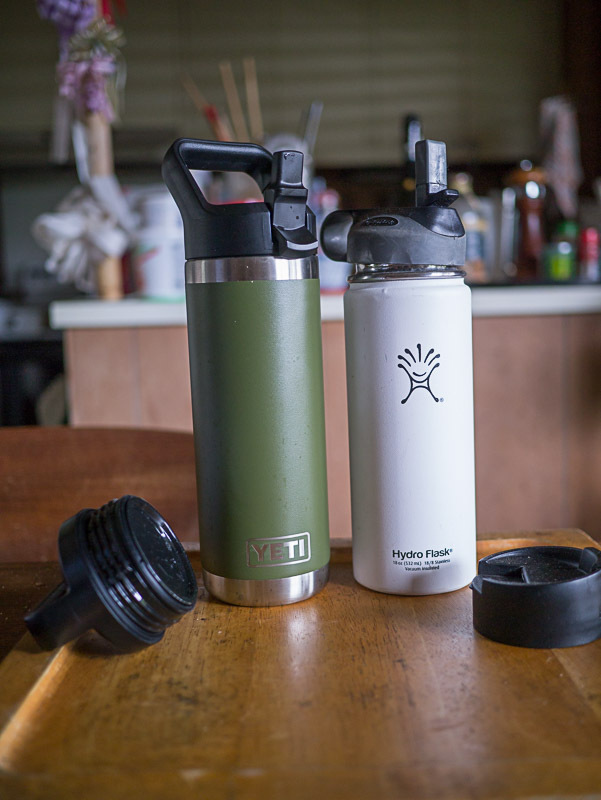 Vacuum (aka Thermos) bottles have existed for decades, even the stainless steel ones, but it seems just recently that to tout one around is trendy. Hydroflask seems to be the ones that kicked this off, they achieved such heavy market penetration that they were everywhere. What also helps is the accessories, it makes them more like sports bottles where you can drink directly from them on the go. Most “old school” vacuum bottles would require you to pour into a cup first, although if you’re a construction worker you would have mastered the skill of lifting the cooler jug above your head and pouring directly into your mouth. Everyone seems to have them, kids, nurses, office workers, ladies where the clang goes along with the jangle of Hawaiian bracelets.And yes, even me. Again, nothing new, I still have my Zojirushi bottle back from the days when you could find a made in Japan stainless vacuum bottle. I have two Hydroflask bottles, and yes they’re nice, when they worked. They both have become just double wall bottles now, having lost their vacuum. They were both freebies so I don’t feel ripped off, but it doesn’t fill me with positive feelings. The first one was a dented freebie, so I can’t fault too much its eventual failure. The second was a promo JCB freebie that rusted on the inside bottom at what looks like weld points. That did not sit too well. Enter Yeti. Yes, I’ve ranted about this brand that popularized the high end ice chest market. What bothered me about them is that despite the high premium pricing, they are made overseas. Yes, there is a difference between good China and cheap China made, but it seems way high, especially since there are comparable products from brands like Pelican and others that are made domestically. Again, this company seems to have made market penetration and trend sparking and has entered the ss vacuum fray with their own line. I finally actually bought one of their small 18 oz bottles. Price wise its comparable. If feel is any indication, the Yeti feels solidly designed and constructed, it’s detectably heavier. That could also be a minus for weight conscious, but if it works better and lasts longer that’ll be a plus for me. I don’t plan to use it backpacking. The “over the nose technology” is their marketing jargon for wide mouth, which makes for a plus that I can fit my hand inside to scrub even this small bottle. I have narrow hands though so I don’t expect most to be able to do this. Yetis are supposed to be dishwasher safe vs the Hydroflask. I’ve used the Yeti a few times and it works well. Unfortunately I can’t do a soda A soda B comparison since my Hydroflasks are all broken. Anyway, time will tell how satisfied I will be with this product.